A couple weeks back, I took my grandma over to Goodwill so she could drop off a trunk load of donations, and as I was helping her unload I caught sight of this big framed painting. Turns out it was a gift given to my grandparents when they got married, and it was about to meet it's thrifted fate. I threw it back into my car, with big plans. Let's consider this the second installment in my Addicted to Gold series. Part one can be found here. Select whatever spray paint you like. 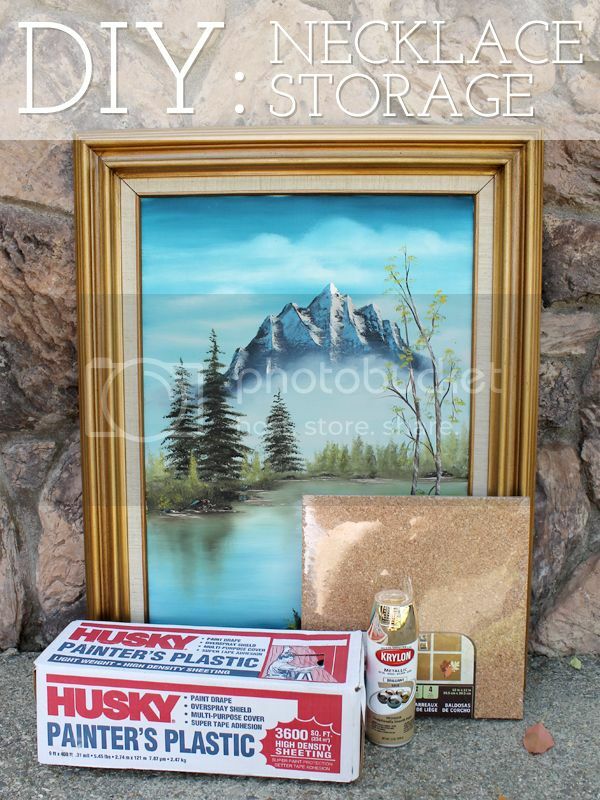 I used Krylon metallic and got it for under $4 at Walmart. I got my cork squares from Walmart as well for about $5. Off to a pretty good start, I should say. Make sure your somewhere well ventilated for the spray paint. I chose the front yard, so all the retirees that live in my neighborhood can walk their dog past me and think about what a young hoodlum I am for tagging this Bob Ross realness. 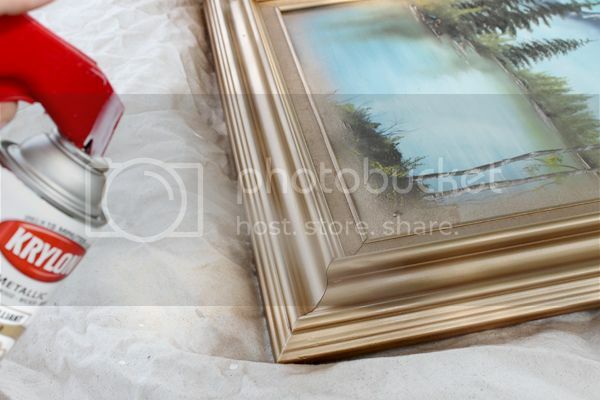 Make sure to wipe down the frame beforehand, and allow to dry completely before you do any painting. Depending on your frame, you may want a primer first. I am impatient and reckless and did without. 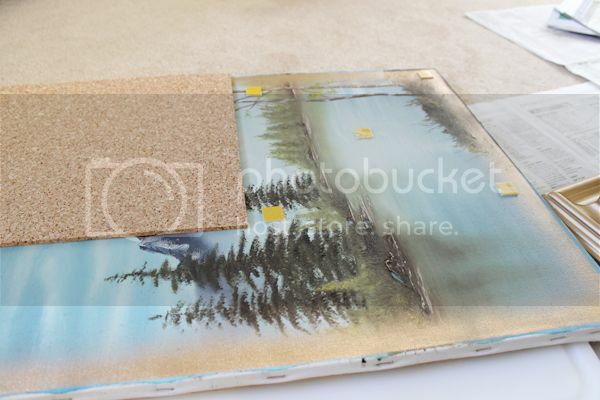 After the frame has dried completely, pop out that canvas and bring it inside. I attached to cork right to the canvas using the sticky backing it came with. They secured it just fine, and although I was considering a spray adhesive, I wasn't sure if it would damage the cork. Also, this was the free option, so. The cork did not fit exactly, so I trimmed the excess by putting the canvas cork-side down on a cutting board and using an x-acto knife. So close, but the cork is a bit of an eyesore. I knew those seems were going to drive me crazy, and the frame looked washed out next to the cork. Undeterred, I found a beautiful piece of fabric for $10 at Moona Fabrics and covered the cork up. I just secured it to the back of the canvas frame with some thumb tacks and voila! So much better! 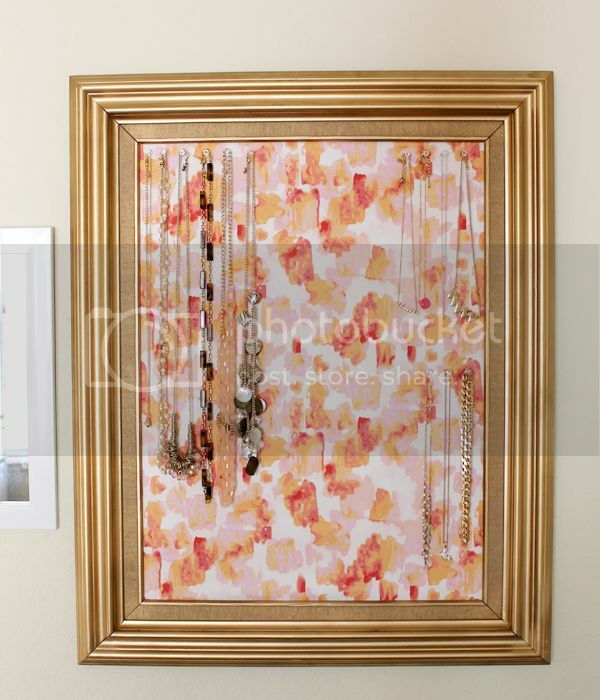 This frame is so big that it does double duty of being art and functional storage. With limited wallspace, that's a huge plus. Also a plus? The fact that all the supplies I actually had to go out and buy cost me $20. Not bad at all. 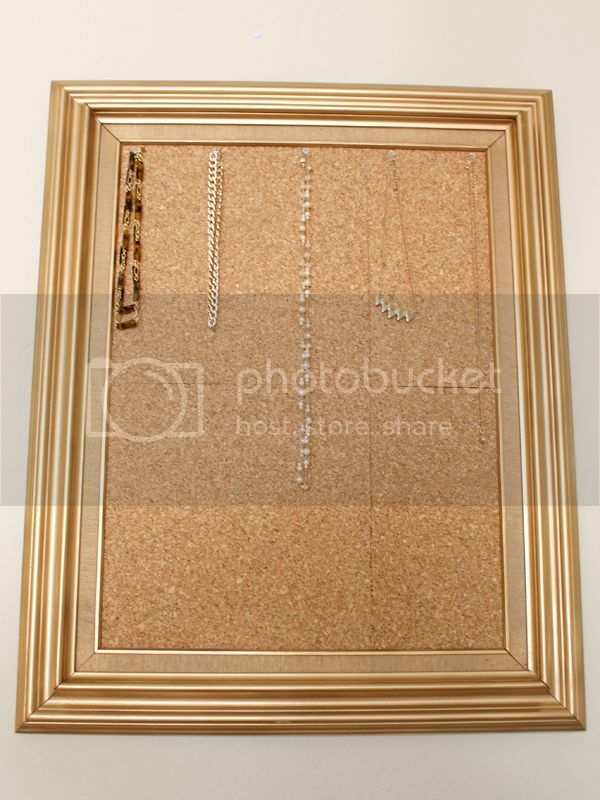 Have you ever made your own necklace storage? I'd love to know what you did differently.